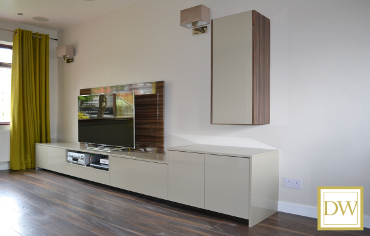 Specialists in creative Kitchens - Bedrooms - Home Office Studies - Bespoke TV Media Units & Lounge Furniture. The majority of our business is from Referrals and Repeat Customers. Please call us and we can make arrangements for you to visit or call any one of our customers; they are only too happy to speak with you about their personal DesignWorks experience. Look at this small sample of our work. Read these genuine customer reviews (actual comments taken from written customer feedback). You too will be Delighted with the Result - when You choose DesignWorks. To view additonal examples of our work Visit our About Us Page & learn more about what DesignWorks can do for You! "'We chose DesignWorks because of the reviews on their website. After searching for a reasonable quote - but more importantly - someone we trusted to carry out the work; we went with Steve. He understood the concept from the outset and even made really good suggestions to improve. Incredibly happy with the result and exactly what we wanted. Thank you'." "We didn't obtain alternative quotes as we'd had previous experience of the company. Good quality products and service. The work was carried out to a high standard and very efficiently. " Mr.and Mrs Rigby, Whitley, Wigan. "Happy with the price but mostly had a 'good feeling' about the company after the initial design consultation. Fantastic service all round. Great knowledge & understanding of customers needs. " Mr and Mrs Element , Standish, Wigan. "Chose DesignWorks as it's a local firm and the competitive price. Very impressed with the quality of the work and the effort involved." Mr and Mrs Rigby, Whitley, Wigan. "Chose DesignWorks for the design - the ideas to maximise floor space and by installing a slimmer worktop on one side was excellent! Good flexibility with the installation date too. Price was comparable with other companies but much better quality and a more personal service." 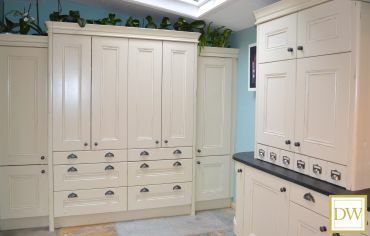 "Repeat Customer (kitchen, master bedroom & bespoke pieces of furniture): Work was done quietly, quickly and efficiently. Steve also completed other unplanned work on our 'new build' while he was working on the wardrobes! We chose DesignWorks as happy with previous work done, reliability, quality of work & quality materials. Many thanks for another great job! " Mr and Mrs Heaven, Whelley, Wigan. 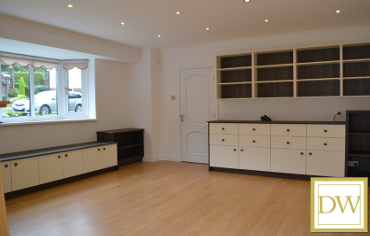 "We are absolutely delighted with our bespoke units in our lounge. The service & guidance from day one has been exceptional and we really do appreciate all your efforts both, Steve & Katharine. It was a pleasure to meet you both & a very big thank you for making our home even better! We chose DesignWorks after a lot of research on the internet. We live one & half hours drive away from the showroom but the DesignWorks website/reviews/info/images etc... were fantastic & really got our attention! Thanks again & all the best! " Mr and Mrs Freeman, Hartford, Cheshire. "The bedroom looks really elegant - the workmanship is excellent and the units are of exceedingly good quality. 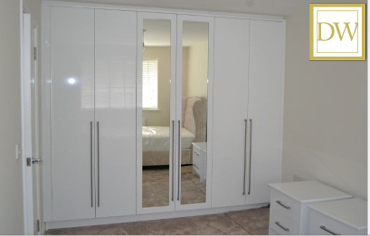 Previous house owner had their bedroom wardrobes fitted by DesignWorks and we were impressed with the quality." Mr and Mrs Pickford, Winstanley, Wigan. "We chose DesignWorks because of confidence given by staff; the initial advice given, follow up prior to agreement and competitive price. Very accommodating re fitting. Excellent service throughout. Very tidy and professional during the fitting service. Positive advice re kitchen design. We would highly recommend DesignWorks and will look to use again as required." Mr and Mrs Dean, Wigan. "Steve was very approachable and happy to accommodate alterations to the original designs as the work progressed. Recommended by friends (Mr & Mrs Garner) & liked their bedroom wardrobes. Also, we felt the finish was superior to other quotes received." Mr and Mrs MacDonald, Coppull, Preston. "The knowledge & advice given was excellent. Steve didn't just try to sell us the kitchen - he gave us advice on what would look and work better design-wise. Both Steve & Katharine were friendly and approachable and made the whole process easy. The quality of work was excellent and the time and care taken by Steve was brilliant. We were kept informed at each stage and Katharine was always available to answer any of our questions. Quality of the advice given and the choice of products seemed much better quality than the other companies we had looked at. Also, really liked that Steve put together the design and then completed the installation himself." Mr and Mrs Peet, Appley Bridge, Wigan. "Chose DesignWorks because we saw good reviews online. Very happy with the work carried out and would recommend! Dear Steve, Barry and I are really pleased we chose you to make our fitted wardrobes. Thanks for the brilliant job you have done. Such quality, attention to detail and superb craftsmanship - JUST WHAT WE WANTED! From Lorraine and Barry." Mr and Mrs Harker, Leigh. "Great selection & great service. We are really impressed; thank you so much the office is lovely - would love to recommend your work." Mr and Mrs Johnston, Boars Head, Standish, Wigan. "Found the service very good. They worked hard and worked to fit everything in before I went into hospital - I was very grateful for this. Our daughter had also used DesignWorks and she was very happy!" "We chose DesignWorks for the quality of the product.The installation was very smooth and efficient. We looked at another showroom but the quality was not of the standard we were looking for. The interior, design and quality at DesignWorks was much better! " Mr and Mrs Martin, Pennington, Leigh. "The design of the furniture on display in the showroom was exactly what we were looking for. The quality is excellent and the price competitive. Very professional job done by Steve. 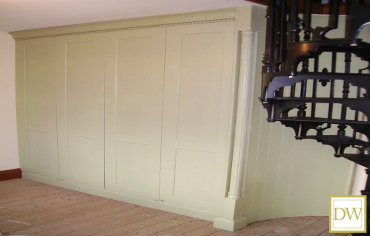 The wardrobes were fitted to a very high standard. The time between ordering and delivery was quite long - but well worth the wait! Thank you for doing such an excellent, professional job. We are thrilled with the finished result and won't hesitate to recommend you. " Mr and Mrs Garner, Shevington, Wigan. "We had high expectations and they were met. Friendly staff, were able to provide bespoke kitchen we desired. We have recommended and will continue to do so." 'Very Satisfied Customers' Whitley, Wigan. "We chose DesignWorks due to the number of positive feedback from previous customers and also a previous installation DesignWorks had done. We thought this would work in our kitchen with some modifications. This proved to be the case and we are delighted with our new kitchen. On approaching DesignWorks for a new kitchen Katharine was most helpful in showing us around the showroom and very patient in answering all our questions. Steve was very informative and gave us an in-depth framework of when the installation would start and finish. He was most professional in all aspects of work and didn't mind all the questions that were asked. We have no qualms in recommending DesignWorks for your new kitchen. " Mr and Mrs Ellison, Ashton In Makerfield, Wigan. "We chose DesignWorks because we were impressed with the professionalism, attitude of the staff and the quality of the products in the showroom." Mr and Mrs Clarke, Hawkley Hall, Wigan. "Repeat Customer (bedroom): Both Katharine & Steve are very friendly, helpful & willing to spend time talking through what is workable & whether what you are thinking about is practical. We are very pleased with the end result! Repeat work - we were so pleased with the result of the work they did in our spare bedroom that we had no hesitation in going back for the work we required in our main bedroom." Mr and Mrs Hodkinson, Leigh, Greater Manchester. "We liked their style. The end product was better than imagined. Excellent service & quality throughout. Steve was great to deal with and ensured we ended up with a great study in line with our brief." Mr and Mrs Barlow, Appley Bridge, Wigan. 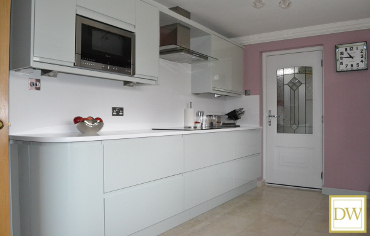 "Quality of cupboards exceeded my expectations and workmanship also. Time keeping was excellent, completed work in the time. Staff extremely friendly and approachable. Prefer to use a local, family business. Exceptional quality - other companies quality didn't seem as good. Would definitely recommend." "Steve addressed our 'Wish List' thoroughly and left nothing out. All our requirements were fully met, and there were lots! The kitchen looks spectacular; the units and worktops are even more fabulous then we could have expected! Nothing was too much trouble for Steve and he is a perfectionist at all times. DesignWorks were recommended to us by a friend but, once we came to the showroom, we knew that we wanted DesignWorks to fit our kitchen and hoped that the cost would be affordable. It was competitively priced- thankfully, and we were pleased to go ahead and thank goodness we did!" Mr and Mrs Mason, Standish, Wigan. "We thought you were brilliant and the wardrobes are amazing. Chose DesignWorks because local, advice given and customer service. (see Google review)." Mr and Mrs Bradbury, Standish, Wigan. "Dear Katharine, we would like to thank both Steve and yourself for all your hard work and care during the project. We are very pleased with our new furniture which looks lovely. Kind regards, Mike and Helen." Mr and Mrs Pollard, Ashton in Makerfield, Wigan. "Repeat Customer (office furniture): We love our lounge furniture. It's perfect, just as we had envisaged how we wanted it to be. We looked at furniture in other department stores but nothing really stood out or met our requirements. We had already worked with Steve to design our office furniture which we are really pleased with. We spotted living room furniture in the showroom at this time & knew we would be back as it looked lovely. It was the bespoke design & fit in our living room that really mattered." Mr Connor and Ms Rowlance, Abram, Wigan. "We approached DesignWorks, being a local company. The design and the quality of furniture are to our satisfaction. We will contact DesignWorks for future needs. Many thanks Steve." Mr and Mrs Sundaresan, Ashton in makerfield, Wigan. 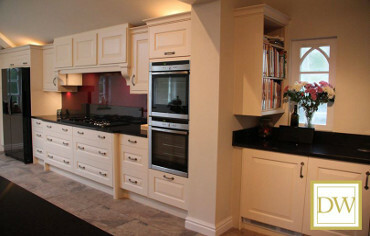 "We chose DesignWorks due to the quality and had trust in Steve and Katharine to deliver us the right quality kitchen. We are delighted with our kitchen and very happy with Steve's work. We found both Steve and Katharine very affable and good to deal with and there were no problems whatsoever. Overall, a really good experience. " Mr and Mrs Woods, Winstanley, Wigan. "We are extremely pleased with our custom-built, office furniture. Until it was completed we didn't know what the finish would look like but it far exceeded our expectations. A massive thanks to Steve for all his help. We compared desks and office furniture on the internet with the same colour scheme but the sizing wasn't suitable and we felt it wouldn't look as good. We chose DesignWorks because we could have fitted office furniture in the style and colour we wanted for a very similar price to 'stand alone' pieces of office furniture that wouldn't fit properly in our room. We were slightly disappointed that the date of delivery was later than we originally wanted. However, Steve delivered earlier than expected which fitted perfectly into our plans so we were 'made up'. A big thank you to Steve. " "Preparation and work of kitchen was done to a really high standard. 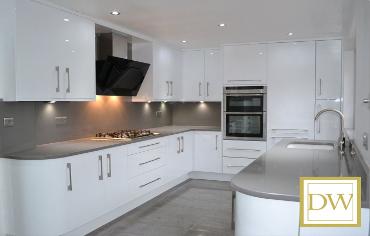 Chose DesignWorks for the quality, workmanship, appliances and kitchen fittings - all to a very high standard." Mr and Mrs Moran, Whelley, Wigan. "Great people to deal with. Really pleased with the wardrobes. Nice to find a company that delivers a great service on time! " Mr and Mrs Metcalfe, Dalton, Lancashire. "We felt the quality of build & the fact that the furniture could be designed & built to our exact needs was a must. DesignWorks ticked the box & made it very easy for us to achieve exactly what we wanted." Mr and Mrs Tyrer, Standish, Wigan. "Repeat Customer (bedroom): DesignWorks previously did our wardrobes. We were very satisfied with the quality and the service. So we didn't want anyone else to fit our new kitchen. The kitchen is beautiful - it's like walking into a showroom! The design makes best use of all the available space and the work was carried out with as little disruption as possible." Mr and Mrs Littler, Garswood, Ashton In Makerfield, Wigan. "Best service and quality workmanship we have ever had. We would go nowhere else. Excellent design and a quality product at a good price." Mr and Mrs Melling, Standish, Wigan. "We were impressed with the displays in the showroom and helpfulness with the design of our bedroom. We are very pleased with the excellent quality and craftsmanship. Thank you for doing a fantastic job. " Mr and Mrs Alder, Wigan. "Love this family business, you can tell there is a real passion in all aspects of their work. Liked the idea of a local business, friendly and felt comfortable explaining what we wanted. We chose Designworks for their quality, care and service." Ms Hatton and Mr Parkinson, Wigan. "I asked for a kitchen that looked like it belonged in our Victorian house. Steve's design surpassed my wildest dreams and I pinch myself every time I walk in the room and see my 'Downton Abbey' kitchen - and at a fraction of what you'd think it cost as well! I chose DesignWorks as everything felt right as soon as I walked in. Steve and Katharine understood what I wanted better than I did! They are friendly, professional and committed to delivering exactly what the customer wants." "Absolutely brilliant job from start to finish. Went to see DesignWorks with only vague ideas of what we wanted and a firm idea of not wanting anything 'modern'. We live in a Victorian house and wanted a sympathetic design that could look as though it had been there since the house was built but which included lots of integrated storage space for our modern paraphernalia! Steve's thoughtful, personalised designs, the quality of the work, the attention to detail (including sourcing slate worktops from Llangollen) and the finished product were amazing." Ms Woods and Mr Barrow, Wigan. "Repeat Customer (kitchen & bedrooms): As usual another excellent job. Minor work needed following completion and was fixed the following day. High standard of workmanship and materials. " Mr and Mrs Turner, Wiinstanley, Wigan. "DesignWorks were able to make exactly what I wanted and nothing was too much trouble. Excellent quality and service, would use them again." "Repeat Customer (kitchen): The quality of workmanship is at the highest standard, and that - coupled with unbiased advice - has delivered exactly what we wanted to achieve. Previously used for kitchen and wanted a similar high quality job for our bedrooms." "Repeat Customer (kitchen): Firstly, great work again - the laundry room and bedrooms look fantastic. We love the new utility; we've filled some of the cupboards already! The children's bedrooms have been transformed with their new spacious wardrobes. Thank you for working around the Painter. I know it's not easy with other people around, it's just how it worked out with him having a free slot." Mr and Mrs Rimmer, Winstanley, Wigan. "Repeat Customer (kitchen): After our first experience with DesignWorks (in 2011) we had no hesitation to come back for advice and ask for major alterations to our kitchen. Ideas came in abundance and after consideration the final design decision was made. Nothing was ever too much trouble and always a friendly face. Why we chose DesignWorks? Brilliant and although very good quality - well, Excellent Quality - the price was better than anywhere else in the Wigan area. Also peace of mind - if we ever have any problems we know they will look after us. Would go back for all our needs!" Mr and Mrs Bullock, Aspull, Wigan. "We chose DesignWorks because of the Quality of the very well finished products and the workmanship which we viewed in the showroom and were always kept informed by phone & email of the project." Mr and Mrs Downer, Parbold, Lancashire. "Steve offered us a complete package. Nothing was too much trouble - numerous visits before the installation - giving advice on building work - providing contacts and even undertaking preparation work himself. Communication was great throughout - Steve made sure we were happy with everything every step of the way. We are thrilled with the Kitchen - from the perfect working layout Steve designed to the great quality and workmanship. We would not hesitate to recommend Steve as he provides probably the most professional & best service we have ever received. We chose DesignWorks for the quality of the furniture and confidence in Steve's workmanship. Also, we did not feel "pressured" with phone calls. We loved the design - superior to any other we had seen and felt that real thought had been put into what would work best. " Mr and Mrs McInnes, Wigan. "We chose DesignWorks because it's a local Company with excellent service. " Mr and Mrs Bennett, Orrell, Wigan. "Very pleased with all aspects of the service, quality, workmanship and on budget. Not the cheapest but if you want Quality go to DesignWorks. Thanks again Steve & Katharine." Mr and Mrs Carey, Bolton. "Repeat Customer (bedroom): We chose DesignWorks because they are a local and family-run business. We had our bedroom done and loved it - so when it came to have our kitchen we didn't even think to go anywhere else! Steve has done an excellent job and we would recommend DesignWorks to anyone, family & friends." Mr and Mrs Thorpe, Whelley, Wigan. "We wanted something modern and of good quality. Very pleased with the end result. The whole process was very easy from start to finish." Mr and Mrs Monteith, Hindley, Wigan. "We are very happy with the speed and commitment to fitting by Steve. The long hours and attention to detail was noted and we are extremely happy with the quality of product and finish. We chose DesignWorks because we just felt they could be trusted 100% - which means a lot to Cheryl and I. Many, many thanks." Mr and Mrs Duckworth, Orrell, Wigan. "Provided exactly what we wanted and within budget, and that's not easy!! Fantastic quality and service from a small local business - DesignWorks is a real gem." Mr and Mrs Ledson, Wigan. "Chose DesignWorks for their Quality and Excellence!" 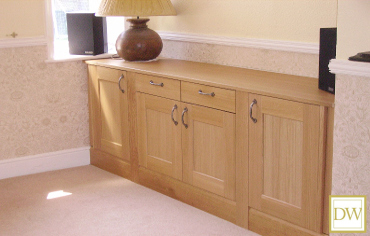 "We chose DesignWorks because they're local, good reviews and able to build bespoke furniture. We had a bespoke unit designed and built. DesignWorks had never done anything like it - it looks exactly as we imagined it and was finished to the highest standard. " Mr and Mrs Booth, Shevington, Wigan. "Found the website very good & with lots of positive customer feedback! Friendly atmosphere in the showroom (Katharine) with good explanation of products and designs. Excellent design and fitting. Quality products and very happy with the design & quote. Excellent time keeping for every appointment arranged from first survey visit through to fitting. (Our past experiences with tradesmen - normally let down on the last minute, not turning up or rearranging etc!!)" Mr and Mrs Forsdyke, Hindley Green, Wigan. "After visiting the showroom and meeting Steve we felt confident - also sorting our radiator problem sealed the deal! Delighted with design and product & would definitely recommend." Mr and Mrs Blank, Whitefield, Manchester. "We chose DesignWorks for the peace of mind in knowing that the kitchen would be spot on. The design, expertise & experience - all second to none and brilliant customer care! Thank you Katharine and Steve for making our dream a reality. Our beautiful kitchen is everything and more than we could have hoped for. Right from the beginning your advice, expertise and experience helped the difficult process of choosing. Your attention to detail, with the design and exacting standards during installation, meant that we could relax in the knowledge that our new kitchen was in safe hands. Every detail is perfect and we are extremely delighted with the end result. We will recommend with no hesitation and be back again next year for a new bedroom. " Mr and Mrs Molyneux, Standish, Wigan. "The whole project from start to finish was handled with integrity, a professional manner & with attention to detail. Chose DesignWorks as no pressure was given, the design of kitchen and the hands-on experience with design & fitting of kitchen." Mr and Mrs Corrigan, St Helens. "We chose DesignWorks for the quality and design. " Mr and Mrs Lawrenson, Astley, Manchester. 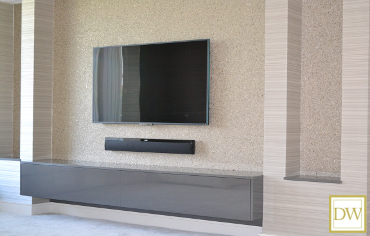 "We saw the TV unit display as we passed the showroom and called in. We are very happy with our media unit, the service and choice available was excellent. We very much appreciated the advice given. We had been looking for months and couldn't find anything suitable, but this is just perfect and is every thing we wanted and more." Mr and Mrs Butterworth, Shevington, Wigan. "Better priced than more well-established, high-end firms but still a superior product. Options were discussed in detail and priced competitively. Friendliness of service and professionalism of fitters exceeded our expectations." Mr and Mrs Heaton, Skelmersdale, Wigan. "A quality product delivered without any hassle!" Mr and Mrs Swift, Winstanley, Wigan. "Thoroughly recommend DesignWorks to anyone. Steve listened to all our pernickety requests and then did an amazing job on the design and the quality and workmanship are wonderful. Love it!" Mr and Mrs Barrow, Wigan. "Attention to detail. Work ethic outstanding. Value for money. We chose DesignWorks because of their experience in the industry. One to one experience from design, installation & completion. All our needs for an outstanding, personal & functional kitchen were met." Mr and Mrs Holland, Winstanley, Wigan. "Repeat Customer (kitchen): Very pleased with the quality and service received from DesignWorks and the hard workmanship which Steve delivered. After having Steve design and fit my lovely kitchen, when I needed a new bedroom it had to be DesignWorks again. Totally satisfied. Many thanks Katharine & Steve." Mr and Mrs Dawber, Whelley, Wigan. "We had two other quotes, both much cheaper, but we were very impressed by the quality of the DesignWorks' units - just as seen in the showroom. The fitters worked very hard and were self sufficient - even in food and drink! Excellent Design and Fitting service and would recommend. " Mr and Mrs Littler, Garswood, St Helens. "Repeat Customer (kitchen & bedrooms): Very pleased with our media units - just as we wanted and has transformed our living room. We received the same excellent service as with our wardrobes and kitchen & utility.Thank you." "We chose DesignWorks for their bespoke service and will certainly recommend." Mr and Mrs Wilkinson, Garswood, St Helens. 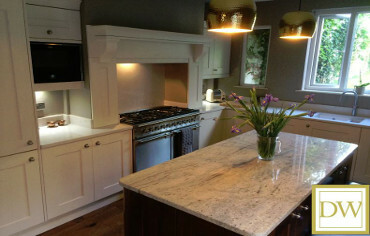 "We are absolutely thrilled with the final design and fit of our new kitchen!! The overall look exceeded our expectations. Steve was great and the whole design included everything that we needed to work in with our life style/needs. We now have lots more cupboard and working space that works perfectly for us. Our kitchen was not an easy or straight-forward fit, to say the least! There was a lot of preparation work and endless problems before the kitchen fit could start. Steve was able to see existing problems straight away and was hugely accommodating, giving us lots of guidance and advice prior to the fit. We were keen to include quality German fittings for their robustness and we got this with the appliances and 'blum' fittings." Mrs and Mrs Price, Standish, Wigan. "Driving past the showroom, we found DesignWorks by accident: But we were so pleased to find you and you gave us ideas we had not thought of!!" Mr and Mrs Whiteley, Shevington, Wigan. "We found the whole experience to be welcoming with unforced friendliness. This applied to all our contacts in the showroom, survey visit and fitting. Any request or question was met & answered with cheerfulness. The quote was higher than any other we had but it was the feel of the company that swung it - we were more confident about the quality of the product and dealing directly with the owners who were not pushy and made us feel more comfortable with the process of buying. Design and fitting service excellent!" Mr and Mrs Finch, Bickershaw, Wigan. "We are very pleased with our new kitchen and utility room. It is beautiful. All thanks to Steve for all his hard work, his suggestions on where to put certain cupboards and drawers, and the advice on the kitchen flooring. So glad we went with straight lines! We have a stunning family space to be proud of." "Chose DesignWorks for the quality of kitchen units. The quality and fitting service far exceeded expectation. Service could not be improved. Excellent." Mr and Mrs Hughes, Shevington Moor, Wigan. "Steve has done an excellent job with our wardrobes. Design and quality best by far. Can't wait to have my kitchen done - I wouldn't go anywhere else. I chose DesignWorks for their knowledge and quality. The whole process from start to finish went without a hitch. Excellent work from Steve. Thank you. " "Read the reviews and was impressed. The whole experience was very positive, different design options were discussed until we decided, they kept in regular contact and nothing was too much trouble. High standard of workmanship, excellent customer service. Thank you." Mr and Mrs McCollom, Newton-Le-Willows, Warrington. "The whole process from start to finish went without a hitch. Times and dates of installation were arranged to suit us, there was no sign of the company being pushy to arrange a time slot which suited them. This is our third bedroom we have had fitted by DesignWorks. We just knew what to expect from start to finish and as usual the end result is quality which has been well fitted at a great price." Mr and Mrs Oxley, Leyland , Lancashire. "I chose DesignWorks for their knowledge, quality & flexibility in providing the best solutions for the space available. I obtained other quotes but DesignWorks were more accommodating to my requirements. Very impressed by the whole process from setting foot in the showroom to the completion of the job. I wouldn't hesitate to recommend DesignWorks to family & friends or to use them again." "Steve has done a fantastic job with our wardrobes. Really pleased with the quality and design. We are looking forward to our new kitchen and utility room next. Recommendation from friends and impressed at the showroom with the quality and ideas suggested by Steve." "It has to be said, we took something of a leap of faith. We consulted other companies who expected us to do a bit of running around - Steve Green did all we needed and more. We cannot stress enough how much everything exceeded our expectations. DesignWorks did all things possible to minimise inconvenience and maximise the whole renovation experience! Hate cliches & soundbites, but in this case, can't find a better way to express our satisfaction. The biggest selling point was that there was no hard sell. Yes, we could have taken a cheaper option, but the quality of the end result justified that leap of faith! Cannot find fault in anything, from start to end." Mr and Mrs Gilbertson, Appley Bridge, Wigan. "The showroom, design service and fitting service - all excellent. During the fitting a 'disaster' was remedied very quickly with virtually no effect on the completion date. This in particular exceeded our expectations as did the attention to details - impeccable! Recommendation from friend and would recommend too!" Mr and Mrs Turner, Winstanley, Wigan. "Repeat Customer (kitchen): Choosing DesignWorks because of the great work in the past, reliable, attention to detail and excellent workmanship. Design perfect in looks and our needs incorporated well. Service just perfect." "By far the best design and quality with quality units. Both Steve and Katharine are very approachable. It's so nice to have work done in your home and be completely confident that all would be ok - had a good feeling about Steve and Katharine and we knew we were in good hands. Would definitely recommend." Mr and Mrs Maddocks, Rainford, St Helens. "Our bedroom was fitted whilst we were away on holiday, so we were delighted on our return to see what an excellent job had been done. The standard was as high as we'd expected after speaking to Steve - and realising what a craftsman he was. Everything was clean and nothing was too much trouble from start to finish. One thing in particular was that Steve rang us when the job was finished to explain about a minute mark on the worktop. A replacement had been ordered immediately, then left for replacing at our convenience. Excellent friendly service." "We found DesignWorks driving past the showroom and visited the website. Very professional service. Steve did his utmost to accommodate our needs and the service we received was wonderful. We are thrilled with our new kitchen and know it will work for us for many years to come. Thank you!" Mr and Mrs Travis, Winstanley, Wigan. "Steve worked well with builders in the early stages - always on hand to give advice and the position of plumbing and electricity points. Kitchen quality and workmanship 'second to none' - the envy of all my friends. Steve gave advice on up-to-date, high quality, kitchen appliances and I find my boiling water tap invaluable. Will recommend DesignWorks to my friends as very very pleased with my kitchen and service received. I chose DesignWorks after my initial introduction to Steve & Katharine as I knew I would be able to work well with them in the future. Many thanks to Katharine for Feng-Shui advice and loan of book." "We wanted new wardrobes for our daughter's bedroom with increased storage. We read the previous customer comments on the website, and all excellent. Our shopping experience could not have been any better. Steve's plan maximised all the available space and we now have a top quality product with so much space. Quality product, very professional and both Katharine & Steve made the whole process so easy." Mr and Mrs Higgins, Winstanley, Wigan. "We would definitely recommend DesignWorks to anyone looking to buy a new, quality kitchen - quality units and appliances with a professional and faultless installation. We chose DesignWorks for the quality, Steve's excellent advice and honesty. " Mr & Mrs Casey, Ashton In Makerfield, Wigan. "From first entering the showroom we could see the quality and standard of workmanship in the displays. We chose DesignWorks because the work on our kitchen was explained to us from the first meeting we had with Steve. He gave us confidence in his initial visit to our home and good advice whilst the work was in progress. Excellent from showroom, design through to fitting service." Mr & Mrs McLoughlin, Orrell, Wigan. 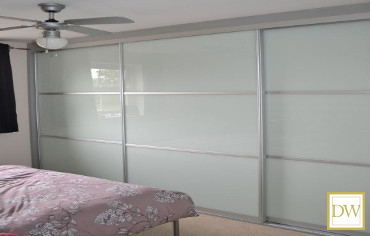 "Repeat Customer (bedroom): As a repeat customer, it seemed logical to have another fantastic job done. We were not disappointed! " Mr & Mrs Oxley, Leyland, Lancashire. "We chose DesignWorks because they seemed to fit just what we wanted on their website. Excellent experience - Very professional, neat and tidy. Fully satisfied with all the work. " Mr and Mrs Simms (Dr. Mercer), Kings Moss, Up Holland. "As soon as we saw Steve's design we knew it was the kitchen for us - great design! Now it's fitted you can see clearly the quality and his attention to detail." "Repeat Customer (kitchen): A house move - so needed another new kitchen! Both Steve and Katharine really do care about you and your project. This was demonstrated throughout the whole process and was clear from the start. We now have a new kitchen that looks good and, just as important to us, it's comfortable and suits our lifestyle. 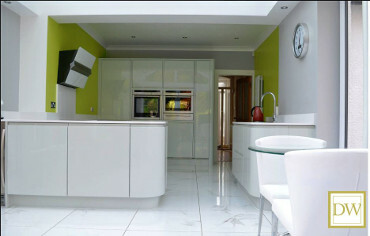 A beautiful kitchen that is great value for money!" Mrs E Duffy, Ashton In Makerfield, Wigan. "Many thanks for our lovely kitchen! Thank you Katharine for your patience and Steve for all your hard work and conscientious approach. From beginning to end Steve was a true professional. He came on time and worked so hard throughout the whole process. His work is excellent and he made the whole procedure completely hassle free. We'll certainly be recommending DesignWorks." "A personal recommendation. Pleasant, polite & efficient. Love the design - and it all works really well. Advice and suggestions made, but never pressurised." Mr and Mrs Shaw, Whitley, Wigan. "I could tell that quality & customer service are very important to Steve & Katharine. I liked the fact that they were a family-run business, local and proud of their work. They also were very reasonably priced for such high quality products. Steve & Katharine were a pleasure to deal with, friendly, professional, efficient and honest. Steve was so helpful & patient in getting the design of our little girl's bedroom just right. The fitting was done to perfection and considerately with minimal mess & noise. We are delighted with the bedroom, everyone who sees it is impressed and we will not hesitate to use DesignWorks in the future. Thank you!! Will be in touch when we are ready to do our bedroom. Kind regards, Louise." Mr and Mrs Stokes, Appley Bridge, Wigan. "Repeat Customer (bedrooms): Thanks once again, for yet another excellent job (this is our 3rd bedroom). We didn't need to go elsewhere for other designs/quotes as we don't trust any other company. Our shopping experience - as always - the best!" Mr and Mrs Dawber, Wigan. "We found the website; Steve did a home survey and we visited the showroom. Whilst you did not have office/studies in the showroom we were both very impressed with the quality of your kitchen/bedroom displays. We are extremely pleased with the design, quality and fit of our Home Office. Steve has great attention to detail not only in the design itself, but also the fitting. Friends and family have all commented on the style & quality. You couldn't have made our shopping experience any better and will certainly recommend you!" Mr and Mrs Johnson, Warrington. "Saw the showroom whilst driving and popped in. Found the choice, and prices more reasonable than the competition and the general approachability of Steve and Katharine fantastic. So grateful to Steve for working on what should have been his time off and getting our wardrobes fitted for us asap. Also, grateful to him for finishing the job so quickly - Thanks so much! Home visit, design & fitting service excellent." "Steve, thank you so much for the beautiful kitchen that you have done for us. We are so pleased with it and can't believe we have a designer, showroom kitchen. You worked tirelessly from start to finish making sure everything was perfect. First class work. We chose DesignWorks because of a 'good feeling' and you'll certainly be recommended by us to everyone. Thank you once again." Mr & Mrs Chadwick, Haydock, Wigan. "The whole experience was made to be enjoyable - and to have such a committed kitchen designer and fitter, who was a gentleman to the end. We would always recommend you to anyone who wanted a quality kitchen or bedroom. The BEST in the Wigan area." Mr & Mrs Bullock, Aspull, Wigan. 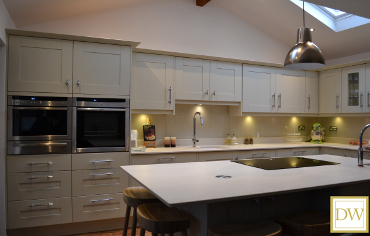 "We are absolutely delighted with our new kitchen & would certainly recommend DesignWorks to anyone. We chose DesignWorks for both the quality of the kitchens and Steve's commitment to designing your perfect Kitchen. The quality & workmanship is second to none." Mr & Mrs Hartley, Ashton in Makerfield, Wigan. "Although we did look in other showrooms, we didn't find what we wanted. We chose DesignWorks for the quality wardrobes and also liked the fact that the work was carried out by the proprietor. 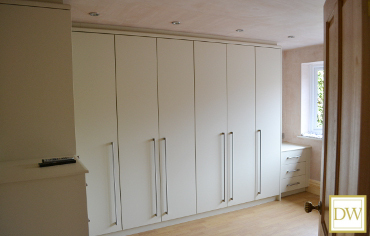 We were very impressed by all aspects of the process from planning to fitting the wardrobes. Thank you to both Steve and Katharine for a very friendly, professional service that we will definitely recommend. Thanks again - just wish we'd had this done years ago!!!" Mr & Mrs Pye, Rainford, St Helens. "Steve listened to our ideas, designed what we wanted in one go - no need to tweak/alter the design. Basically he hit the nail on the head first go! Excellent service from first point of contact. Clean, courteous, reliable, all workmen worked to a very exacting standard." Mr & Mrs Moss, Orrell, Wigan. "We were very impressed by the initial visit and the information & suggestions made at that time. We are VERY happy with our new Kitchen and definitely recommend DesignWorks! " Mr & Mrs Bannister, Standish, Wigan. "DesignWorks was recommended from a previous customer. The design service worked really well - Steve really knows how to make the design work. He took my ideas then made the design balanced to a very practical, workable kitchen. Workmanship is fantastic, fitting is excellent! " Ms L Loines, Boars Head, Standish, Wigan. "DesignWorks provided the best quality, designed with superb attention to detail and gave exceptional customer service throughout. We are over the moon and have already recommended you to our friends and work colleagues!" Mr & Mrs Fallon, Wigan. "Had the kitchen we wanted together with the expertise. Pleased with the whole process from start to finish. The fitting and care taken was excellent." Mr & Mrs Scawthorn, Wrightington, Lancashire. "From the moment I stepped into the DesignWorks studio and met Steve I knew instinctively this was the company for me to use; having had 8 other kitchen companies design and quote, I liked your relaxed, professional approach. I am delighted with my new kitchen, and would recommend DesignWorks to anyone who wishes to have a positive experience at what can be a traumatic time. Steve gave a totally professional design service, having many years of experience in this field - not pushy in any way. His advice was excellent and well informed. Jonathon fitted the kitchen expertly, his workmanship was faultless; it was a pleasure to have him working in my home. Thank you for such an excellent service from start to finish, and providing a kitchen of excellent quality. Friends and family walk into my kitchen and have one word to say - WOW." 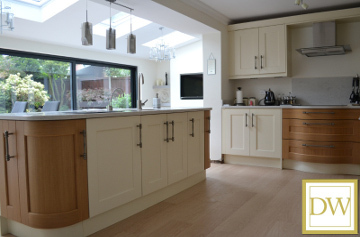 "I have a beautiful, well designed & fitted kitchen, all thanks to the team at DesignWorks. Their knowledge and experience was evident at all stages, they delivered everything they promised and nothing was too much trouble. Both Steve and Katharine took a personal interest and invested time in making sure we got the kitchen we wanted. DesignWorks made the whole experience as stress free for us, the customer, as possible. I would recommend them to anyone & look forward to dealing with them in the future. I feel like I've made some new friends." Mr & Mrs Forbes, Lowton, Warrington. "A painless experience. Could not fault from initial visit to showroom - to the final result. Will certainly recommend to anyone." Mr & Mrs Oxley, Leyland., Lancashire. "Thank you Steve and company for a very professional job designing, supplying and fitting our new kitchen. We found the experience very pleasant and everything went like clockwork. Once again thanks, we are more than pleased with our new kitchen." Mr & Mrs Parrish, Winstanley, Wigan. "Felt we could trust you in doing the best job for us! 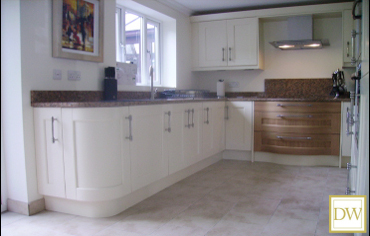 Thank you for all your help and providing us with the designer kitchen we wanted." Mr & Mrs Myers, Charnock Richard. "Offered something different and gave us confidence. We bought a new kitchen and master bedroom." Mr & Mrs Lever, Westhoughton. "We are thrilled with our new kitchen. The design was unique, well thought through with regard to the layout of appliances, accessibility, etc. Steve and Katharine have a great sense of excellence in all they do, and it shows in the quality, design and great customer care before, during and after sales. We would definitely recommend DesignWorks to our friends, but when they see our kitchen it speaks for itself." Mr & Mrs Taylor, Wigan. "Liked the window display and went in - quick prompt service with no hard sell or excess talk." Mr & Mrs Walker, Astley, Manchester. 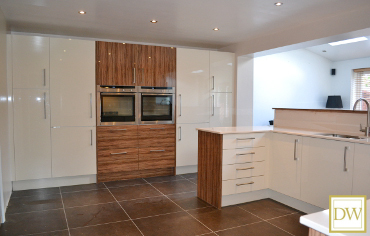 "Recommended by our neighbour - we found our ideal kitchen in the showroom." Mr & Mrs Rigby, Billinge, Wigan. "We felt that Steve designed the kitchen with care and consideration - he wanted us to love it, not just like it. Jonathon, the fitter, was very particular - everything had to be spot on, not just ok. Overall, we have been, and still are, delighted!" Mr & Mrs Foster, Billinge, Wigan. "Recommended to me for excellent customer service... I had confidence in the proprietor. The price, although a little more than similar size operations, was competitive in view of slickness of the whole process." "Linda and I would like to express how pleased we are with the work carried out in our new apartment. The design, quality of manufacture and the installation are everything, if not more than, we had ever hoped for. The units certainly enhance the quality of our new apartment and add to the style of living we are looking for." Mr & Mrs King, Wigan. "The attention to detail was far superior to any other kitchen company. From beginning to end, our experience with DesignWorks has been enjoyable... Steve's designs were far superior to any other kitchen company we visited. He gave helpful and knowledgeable advice. We would definitely recommend DesignWorks to our family and friends." Mr & Mrs Thomas, Standish, Wigan. "Thank you very much for the perfect result. Extremely helpful staff - from showroom to fitters. Able to work with Designer (Steve, the Owner) as to our requirements, suggestions & plans. Nothing at all was too much trouble, we felt like real customers in the true sense of the word." Mr & Mrs Dawber, Wigan.